Today we live in an age where technique in the arts can be of a high technical character yet the narrative is profoundly disjointed, a right old bag of mix and match, with a totally a historic approach to events that starts with a therapists couch and slots events from the past in to construct a story that justifies our present state of mind. I’m a child of the 1970’s and remember the hilarious Brooke Bond PG Tips adverts with chimps, like this Mr Shifter one (http://www.youtube.com/watch?v=HgzEBLa3PPk), and have seen such adverts removed from our screens because of the way they demean animals, though in truth they objectify the working class more than they do any chimps. What a contradictory time of scientific advance symbolised by going to the moon, political excitement and decay symbolised by widespread industrial militancy and the person is political counter-culture. Ecological sensitivities are also being given some wider airing, though still something of a niche market then, symbolised by Jacques Cousteau and Gerald Durrell. In the midst of this era of scientific progress, political debates of whether nature or society determine our sociology and psychology, and increasing focus on the effect of ecology on evolutionary trends, research of great apes and chimpanzees increased. This research involved observing them in the wild, to testing them in the laboratory, including the testing of reactions to chemicals ahead of humans being exposed to them. Trying to better understand the nature vs nurture debate regarding the development of language, inevitably led to conducting some experiments on other animals including chimpanzees to see if they could be trained to use some form of language. Pigeons for example had been conditioned to respond to stimuli in ways determined by human experimenters, so being able to train some animals to develop language skills was a great scientific challenge, and chimpanzees were considered one of the closest matches to humans genetically. Project Nim was an experiment organised by Columbia University, led by Professor Herbert Terrace - behavioural psychologist and specialist in primate cognitive abilities at New York's Columbia University. Using a chimpanzee named Nim Chimpsky, given his name as a pun on Noam Chomsky, the foremost theorist of human language structure and generative grammar at the time, the study aimed to refute Noam Chomsky's thesis that language is inherent only in humans. 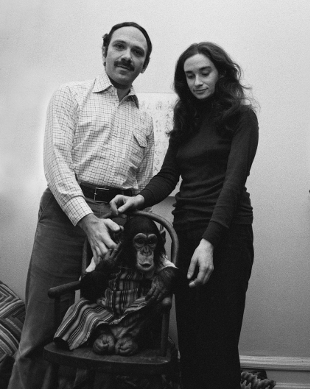 The nub of the experiment was to raise a chimp like a child and try and teach it fragments of American Sign Language so it could make himself understood. 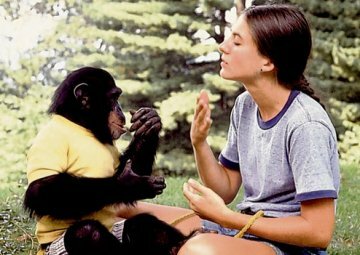 Project Nim followed a similar study by R. Allen and Beatrix Gardner called Project Washoe, in which another chimpanzee, named Washoe, was raised like a human child, given affection and participated in everyday social activity with her adoptive family. 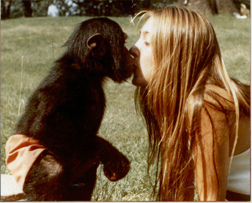 Her ability to communicate was far more developed than Nim's, though notably Terrace is cited as disputing many of their findings, along with the findings in Project Nim retrospectively. I’m not sure we need Chomsky to help us deconstruct the heavily layered and emotive language used in this summary introduction. I guess the only element of this setup that could appear objective from the viewpoint of a documentary, is that all humans involved have failed to understand the problem they present a chimpanzee centred world, including the objectified new “mother” who passively receives the ‘seized’ chimp like the handler of stolen goods. Shortly after this awkward opening presenting the brutalising of the baby chimp and his birth-mother, we move a more sophisticated and delightfully presented character assassination of Nim’s new human ‘mother’. Often using superbly framed interview segments with Stephanie Lafarge, Nim’s surrogate mother, spliced with footage from the time, and the accounts from other players in the story, we’re shown how quickly Nim adapts to living in a bohemian New York family, where he’s seemingly allowed to run riot through the house. With the inclusion of Stephanie breast feeding Nim in the early months, we learn how Nim is treated as close to any other baby, including being dressed as one. Most revealing perhaps is the way Stephanie shows scant regard for the way Nim launches into trashing her husband’s books when he comes between himself and Stephanie. This is hippy anti-intellectualism at its best, hilariously endowed with subversive tendencies by Stephanie. This all seems very odd for our conformist and risk-averse times, but by no means unique as at the same time at Project Nim, I remember visiting my brother who worked as a zoo keeper at Flamingo Park Zoo (now Flamingo Land) near Pickering in north Yorkshire - a provincial place for sure, and no Columbia University. I went in the cage / kitchen setup where a young orang-utan (with pecking order issues for sure) was being raised in a human setting to see how it developed, and quickly learned it was no child as made a beeline straight for my nuts rather than the Ready Break I was trying to feed it, and I remember being struck by the enormous strength of the animal. With all the vulgarity of Jeremy Kyle, the decision by Herb Terrace to move Nim from such an anarchic environment to a more structured one for scientific research, was sexualised in a way that encourages us to think of the experiment as a banal vehicle for Herb to get his end away with another research student or two, like the alpha male Nim was striving to be. As the story continues with this base reductionism it set out with, the techniques used to present the process just about keep your interest because of their elegant framing and delivery. In a way that beggars belief, the tales of damage caused by Nim to his human carers are couched in such a way as the endow Nim with a degree of playfulness rather than clearly demarcate him as an animal actively causing humans much physical damage. The greatest wrath though is held back for Herb, who in one shot is asked about the specific course of events after one researcher is bitten on the face by Nim some 35 years earlier when he wasn’t even present. His vagueness is presented as lack of interest, and goes on to present his photo shoots with Nim as part of his own arrogance. When Herb closes the Project down on the basis that Nim is becoming too dangerous and that the experiment had essentially failed to prove a chimp could develop language, he’s again setup as heartless and arrogant, especially when Nim is sold off to a research lab, where he’d be used to test vaccines before they’re released for use on humans. In his comments after analysing the data more thoroughly, Herb quotes Nim's longest sentence as the 16-word-long "Give orange me give eat orange me eat orange give me eat orange give me you." The association of some signs didn’t really amount to understanding or using language. The remainder of the film follows the life of Nim as he’s ‘rescued’ into a purpose built cage on a farm in Texas, but on his own, then found other chimps to live with, then nearly kills Stephanie when she visits him and gets in the cage with him many years after having raised him. This portion of the film merely drives the moral of the story home – that humans are mostly rubbish, probably worse than chimps, but should organise society and its resources around what a few self-appointed chimps advocates think is best for them. Provided you can stomach the anti-human message throughout the film, it is definitely very interesting and thought provoking, especially the nuggets of excitement and adventure involved in trying to discover new scientific knowledge in the 1970’s. The filming, editing, direction and musical backdrop are truly excellent and helps you to stay in your seat – a very comfy one at the Cornerhouse, but without the quality of production I would have wanted to get up and go and rage somewhere. The film's message is very well summed up with these quotes from other reviews..
“A documentary about a radical 1970s social experiment shows human beings in a pretty poor light…Without any of the human participants acknowledging or even realising it, Project Nim was effectively a manipulative experiment in human sexual behaviour and family life... It's impossible to avoid the sense that Project Nim is the story of emotional abuse… Nevertheless, this is a gripping documentary. The chimp comes out of it well. Homo sapiens, of course, is found wanting.” (read the full review at http://www.guardian.co.uk/film/2011/aug/11/project-nim-review). “The whole thing is just painful to watch. I couldn't help but feel sympathy for the chimp and anger at the people ... especially Professor Terrace. His selfish, ill-conceived project negatively impacted the life of a chimp and the safety and well-being of many good-hearted people along the way.” (read the full review at http://www.imdb.com/title/tt1814836/reviews). Editor's Note: The issue of scientifically trying to understand what's unique about humans, will be visited by the Salon with its joint public discussion with Cafe Scientifique entitled 'I feel your pain: do humans and animals suffer similarly?' on Wed 28 September.